No Regrets for Our Youth was the second film Akira Kurosawa directed after the end of World War II. 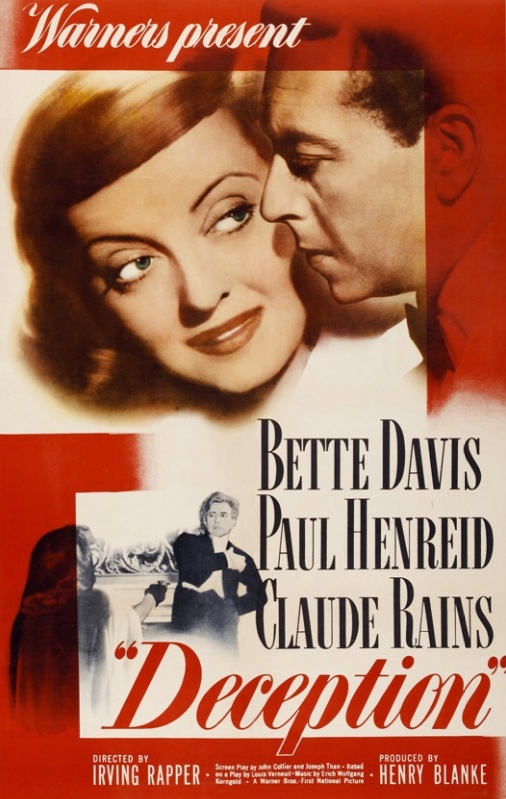 (The first was Those Who Make Tomorrow, which was released on May 2, 1946. He was forced to direct it by Toho studio bosses. 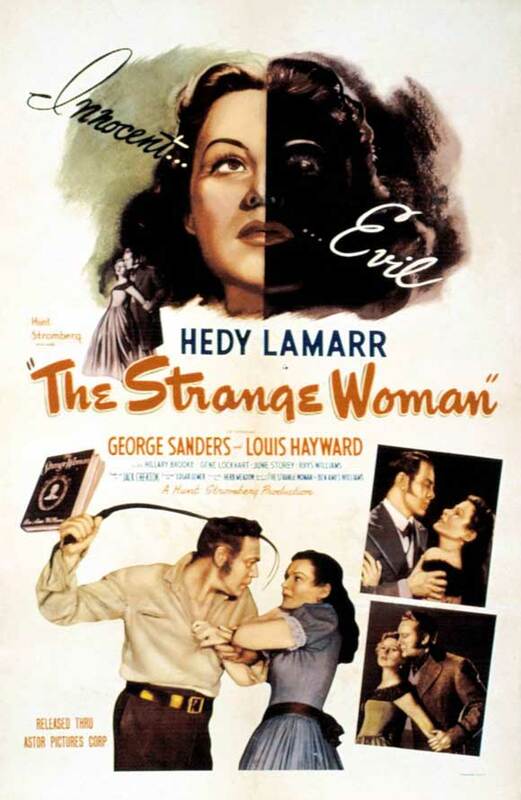 He disliked making the film and never included it in his list of official credits.) No Regrets for Our Youth is an interesting counterpart to two other films I watched this year, Italy’s Roma, città aperta (Rome, Open City) and Germany’s Die Mörder sind unter uns (The Murderers Are Among Us). These three pictures are all early efforts by filmmakers in former Axis powers to come to terms with the enormity of World War II. Roma, città aperta represents an almost total abnegation of responsibility, which is fair enough, considering the role most Italians played in the war compared with the litany of horrors perpetrated by Germany and Japan. No Regrets for Our Youth is more similar to Die Mörder sind unter uns. Both films are stridently anti-Fascist, but both sidestep the gruesome specifics of what actually went on during the war. 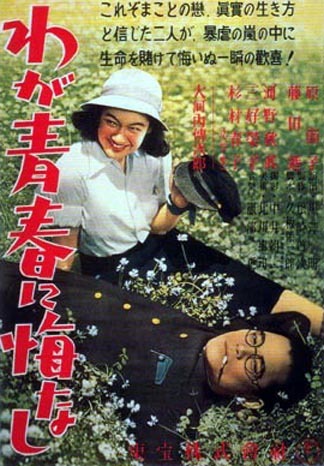 Setsuko Hara stars as Yukie, the daughter of a university professor with leftist leanings. (Hara would only work with Kurosawa once more, when she starred in his film The Idiot in 1951, but she was one of Yasujirô Ozu’s favorite actresses, and starred in six of his films from 1949 to 1961.) The film begins immediately after the 1933 University at Takikawa protests against the Japanese invasion of Manchuria. Yukie is courted by two young men, Ryukichi Noge (Susumu Fujita) and Itokawa (Akitake Kôno). Itokawa is sensible and boring, while Noge is a political firebrand and hot-headed. Yukie is naturally drawn to Noge, but he is arrested after a demonstration and spends four years in prison. When he is released, he seems to be a changed man; broken in some essential way. Yukie packs up and moves to Tokyo, where she lives for three years, toiling away in a variety of menial jobs. Itokawa and Noge both re-enter her life, and she ends up marrying Noge, who is now involved in espionage. Eventually he is arrested by Imperial forces, and Itokawa, who is now a lawyer, steps in to defend him. No Regrets for Our Youth is a film with two distinct halves. The second half, in which Yukie goes to visit Noge’s parents, is visually and dramatically stronger than the first. Noge’s parents are both simple farmers living in a remote village. They are terrorized by the other villagers because their son was a spy, and they never go out during the day, only planting at night. Yukie decides to stay with them and fight against adversity, finding value in tilling the land. 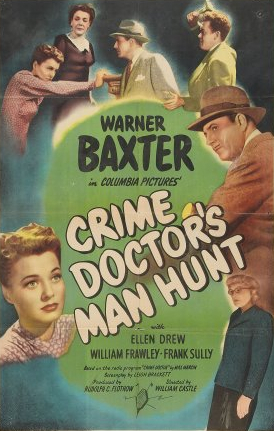 It would be decades, of course, before most filmgoers in the West would see this film. The first Kurosawa film to make any impact outside of Japan was Drunken Angel (1948), and Kurosawa didn’t have a true breakout success until Rashomon (1950), which won the Golden Lion at the Venice Film Festival in 1951. No Regrets for Our Youth is a good film, but it’s not a great one. The performances from the lead actors are excellent, especially from Hara. She ages and grows over the course of the film in a realistic way, which is important when a film covers a period of many years. The story is involving, but not exactly what I would call “gripping.” The scenes in the rural village have a distinctly Soviet flavor to them, and I believe that Kurosawa made this film in an atmosphere of heavy censorship and control by occupying forces. This is the earliest Kurosawa film I’ve seen, so I don’t know what his pre-war films are like, but it seems to me that he really came into his own as an artist starting in the late ’40s, when he reworked American and European stories and film techniques for pictures like Stray Dog (1949) and High and Low (1963), two of the best police procedurals ever made; Seven Samurai (1954) and Yojimbo (1961), two samurai films that drew heavily from American westerns and were in turn copied over and over by directors making actual westerns; and his reimaginings of Shakespearean dramas set in feudal Japan, Throne of Blood (1957) and Ran (1985). Posted in 1946, October 1946 and tagged Akira Kurosawa, Akitake Kôno, Asakazu Nakai, わが青春に悔なし, Denjirô Ôkôchi, Eijirô Hisaita, Eiko Miyoshi, Foreign Films, Fusako Fujima, Haruko Sugimura, Haruo Tanaka, Hisako Hara, Japanese Cinema, Kazu Hikari, Keiji Matsuzaki, Kokuten Kôdô, Masao Shimizu, No Regrets for Our Youth, Ryo Takei, Setsuko Hara, Shin Takemura, Susumu Fujita, Tadashi Hattori, Taizô Fukami, Takashi Shimura, Tateo Kawasaki, Toei Company, Toho Company, Waga seishun ni kuinashi, World War II. Bookmark the permalink. 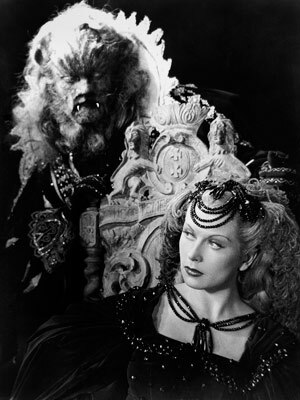 Jean Cocteau began filming La Belle et la Bête (Beauty and the Beast) almost immediately after the end of the Nazi occupation of France. It wasn’t a quick or an easy shoot. Cocteau had to contend with limited film stock of varying quality, cameras that jammed, aircraft flying overhead that ruined the sound, and the general disarray of post-war France. The 56-year-old Cocteau was a well-known writer, poet, visual artist, and director of avant-garde films, but this was his first foray into mainstream filmmaking. It begins with an exhortation to audiences to remember what it is to be a child, and to experience magic without the jaundiced eyes of an adult. This is probably a direct reaction to the critics (most notably Jean-Paul Sartre) who felt that Cocteau was not political enough. Cocteau’s only allegiance in life was to art, and it is appropriate that he made this film as a reaction to critics, since it’s one of the most beautiful and magical pieces of filmmaking I’ve ever seen. His plea to audiences that opens the film seems unnecessary. This is a film that speaks for itself. In adapting the 18th-century fairy tale, Cocteau used a lot of the same techniques he used when he made his experimental 1930 film Le sang d’un poète (The Blood of a Poet); simple special effects, an obsession with mirrors, statues that come to life, and tricks of speed and perspective. As in the original story (most famously written by Mme Jeanne-Marie Le Prince de Beaumont in 1756, although she didn’t create the tale), Belle (played by Josette Day) lives with her merchant father (Marcel André) and her two nasty, selfish sisters, here named Félicie (Mila Parély) and Adélaïde (Nane Germon). Cocteau added two male characters, Belle’s brother Ludovic (Michel Auclair) and her handsome but shallow suitor, Avenant (Jean Marais). The domestic scenes in the film are designed and lighted to look like paintings by Vermeer and Rembrandt. The characters all wear 17th-century costumes, and the interiors are beautiful to look at, even though the human drama is stifling and petty. Félicie and Adélaïde bicker and ridicule Belle, and are indifferent to their father’s rising debts. Meanwhile, Ludovic and Avenant avoid all responsibility and are only interested in the pursuit of leisure. When Belle’s father rides off into the woods, the mood of the film dramatically shifts. Using a combination of real parks and woodlands with studio sets, Cocteau creates a magical fairy-tale world directly based on 19th-century engravings by Gustave Doré. When Belle’s father first enters la Bête’s castle — revealed when a gate of tree branches magically parts — his shadow moves against the castle entrance even though he is standing still. Once inside, candelabras held by human arms mounted into the wall magically spring to light. It doesn’t matter that you can see wires holding the candelabras aloft; the simple but painstaking special effects are still breathtaking. When Belle’s father sits down in the banquet hall, sculptures of human faces on the mantel of the fireplace are actually the faces of human actors covered with soot, their bright eyes the only thing about them that looks alive as smoke pours out of their nostrils. This delineation between fantasy and reality continues throughout the film. 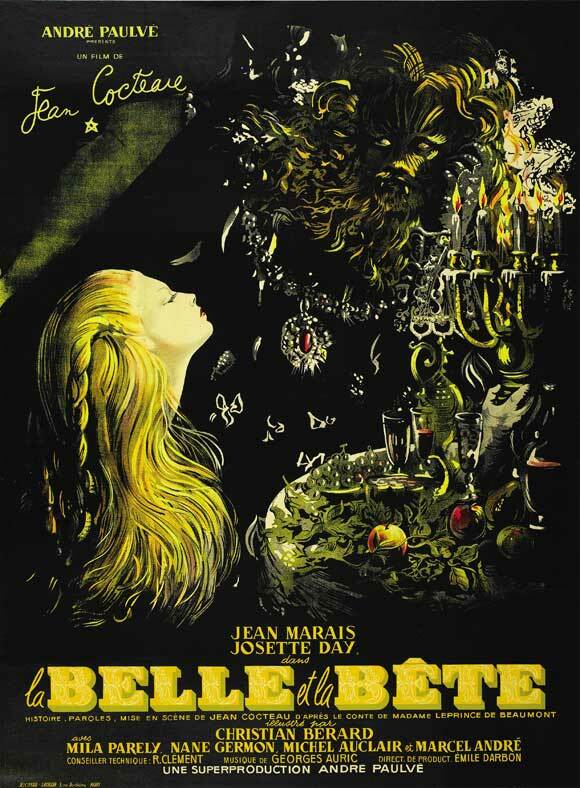 When Belle enters the castle to fulfill the punishment meted out to her father for picking one of la Bête’s white flowers, she floats through long corridors full of billowing white curtains in dreamy slow-motion. There are doors and mirrors that speak to her, and a bed with a white fur spread that slithers open. The special effects are simple, and a lot of them are done “in the can” by simply reversing the film. It’s been awhile since I’ve seen Disney’s 1991 version of this fairy tale, but that film bears an enormous debt to Cocteau’s version. Everything from the look of the beast to the costumes, set design, and subplot about Belle’s jealous suitor are lifted directly from this film. While the Disney version is perfectly competent, it doesn’t have the otherworldly power of Cocteau’s vision. La Bête, in particular, is less cuddly and more uncanny here. He’s played by Jean Marais, who also plays Belle’s suitor, Avenant, which would be distracting if he wasn’t completely unrecognizable under the heavy makeup and mountains of hair. Marais plays la Bête as a noble, leonine creature with a deep nasal monotone. Unlike the lovable furball of the Disney film, there are a few moments in which he is truly frightening; appearing as if by magic when Belle’s father picks a flower, drinking from a brook on all fours like an animal, or standing over the carcass of a deer that he has mutilated. Given that Cocteau was gay and Marais was his longtime lover, it’s tempting to read a lot into this film. For Freudian readings of heterosexual power dynamics and the vagaries of lust, the Beauty and the Beast myth is second perhaps only to the story of Bluebeard. Are all men beasts who must stifle bloodthirsty and rapacious urges in order to be with women? Did Cocteau, who had begun to suffer from painful eczema, feel like a beast himself? All theories are welcome, but I prefer to heed Cocteau’s advice in the preface and take this magical film at face value. Posted in 1946, October 1946 and tagged André Paulvé, Beauty and the Beast, Claude Ibéria, DisCina, Fantasy, Foreign Films, French Cinema, Georges Auric, Henri Alekan, Jean Cocteau, Jean Marais, Jeanne-Marie Leprince de Beaumont, Josette Day, La belle et la bête, Lucien Carré, Marcel André, Michel Auclair, Mila Parély, Nane Germon, Raoul Marco, René Clément, Romance. Bookmark the permalink.